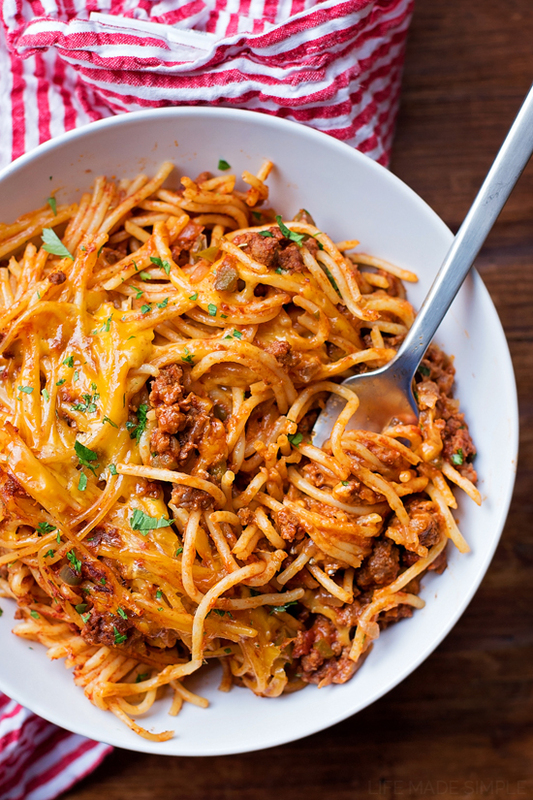 This stuffed pepper spaghetti bake is a quick, easy and delicious meal. It’s comfort food at its best! This is one of my favorite meals from my childhood. 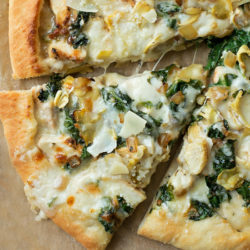 My mom would make this for us often, and it was always devoured within seconds. I’ve made it several times during the past few months, trying a few different methods and ingredient substitutions, and no matter what I did to it, it tasted just like I remember! 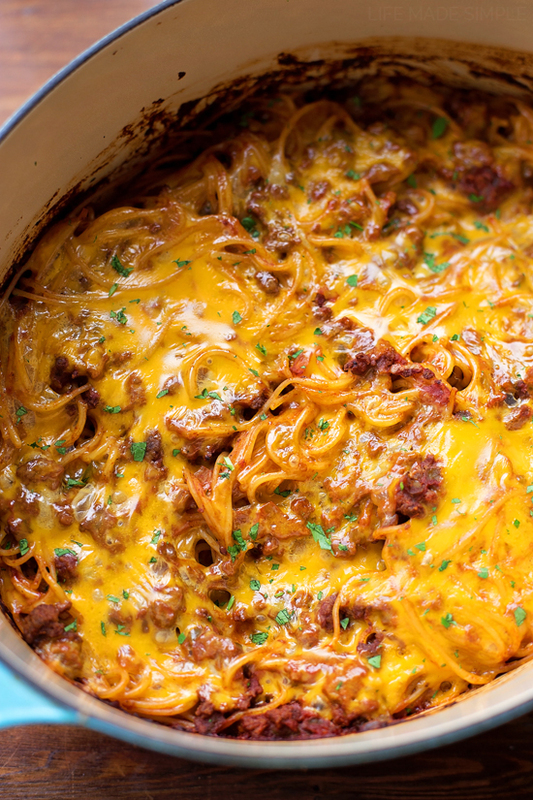 This one-pot wonder is hearty, cheesy and perfect for those busy weeknights! Give this one a try ASAP, because you’re going to love it!! To start, you’ll want to boil your pasta and set it aside. To make this a “one-pot” meal, I generally do this first, and then proceed with the recipe. However, if you’re in a time crunch, I’d suggest grabbing another pot so it can boil while you make the rest (see NOTES for low-carb options). In the large (oven-safe pot), add a bit of olive oil and saute the onion and bell peppers over medium heat. This generally takes about 5-7 minutes or so. Sometimes I like to add a splash or two of water during the last few minutes to keep them from getting too brown. This allows the onions and peppers to soften and sweeten as they cook. Add the minced garlic and cook for 1-2 minutes until fragrant. Next add the ground beef. 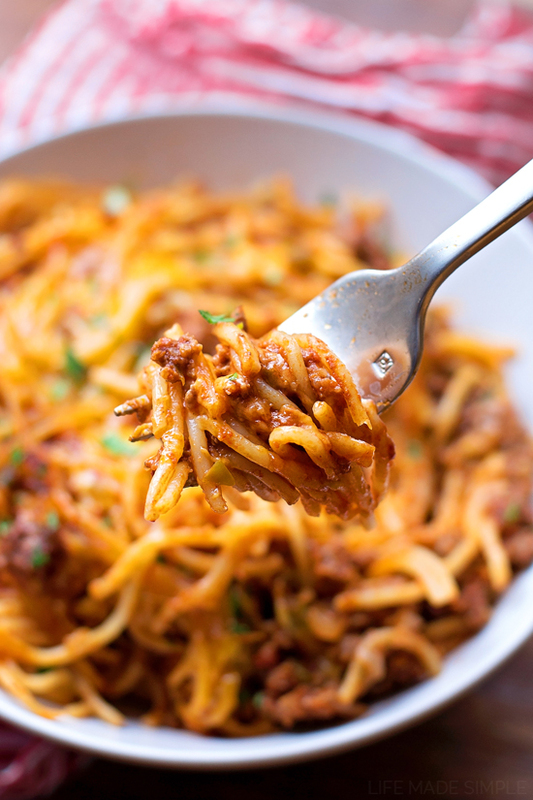 I prefer using a 93% lean ground beef for this particular recipe, but 85% works well too. Depending on how much grease is left in the pan, you may need to drain it. When the beef is nice and brown, add the Italian seasoning, parsley, salt, pepper, tomato paste and cream of tomato soup (see NOTES for swaps). 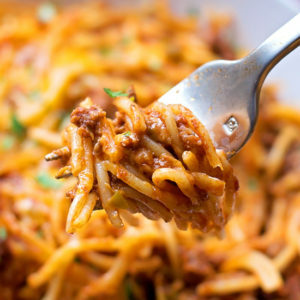 Stir everything together, then toss in the noodles along with 1/4 cup of grated cheddar cheese. Sprinkle the top with the remaining cheese, then place in the oven to bake for 20 minutes or until it starts to get golden brown. 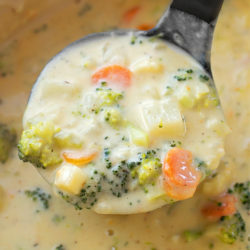 Again, if you’re in a big time crunch, you can always skip that last step (although IMHO it adds a nice level of added flavor to it) and just turn the heat off on your stovetop, cover the pot, and let it sit for 5 minutes or until the cheese gets melty. Sometimes dinner needs to be done in a hurry, I definitely get that! 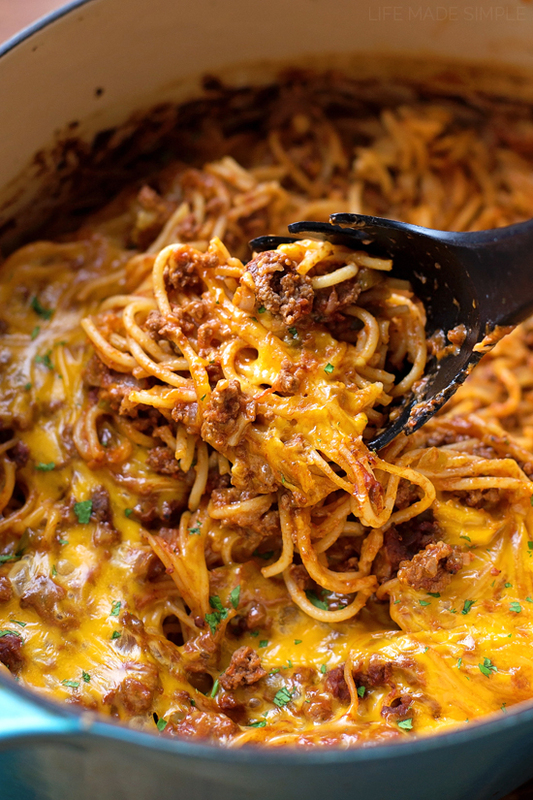 My kids loved this stuffed pepper spaghetti bake as much as I did when I was little. It’s a great meal to throw together when you don’t have a lot of ingredients on hand and can easily serve a crowd. Plus the leftovers taste great, which is kind of a big deal if you know me! Give this one a try and let me know what you think. Enjoy! Prepare the noodles according to directions on package, drain and set aside. Add the ground beef, break it up as it browns. When the beef is fully cooked, add the Italian seasoning, parsley, salt, pepper, tomato paste and cream of tomato soup. Stir, then add the noodles along with ¼ cup of the cheese, toss to combine. Sprinkle the top with the remaining cheese and place in the oven to bake for 20 minutes or until the cheese starts to brown on top. Remove and allow to cool for 6-8 minutes before serving. 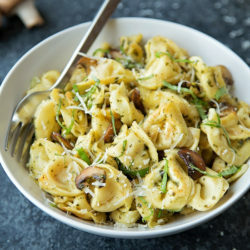 Garnish with freshly chopped parsley, if desired. *You can use whole-grain or gluten-free. For a low-carb option try spiralizing 3 large zucchini or using the "spaghetti" from 2 small spaghetti squash. hey girl yummy! This looks amazing! Right up my alley!